By the third week in August 1880, Mrs. Gray was comfortably settled in New Hampshire, where she had evidently not lost her discerning eye for nature or the capacity to translate her views into prose. Plaisted House, Jefferson, Sunday, 22 August 1880: We came here yesterday, having had a comfortable ride up – part of it, along the shores of Winnisquam & Winnipesaukee, and very beautiful. We found more change of the leaf than we expected so early in the season; but in low lying, moist grounds, the young maples, swamp alders, sumach &c blazed out into flaming crimson, scarlet and orange colours, like tongues of living fire against the dense, solid greens of the summer foliage; and the banks and wild pastures were carpeted with bloom – the golden-rod & yellow tansy, the white yarrow that “heals the wounded heart,” and every variety of pink spireas and purple asters & immortelles, and rich red cardinal flowers that made a glory whenever they nodded to the breeze, and great beds of night-shade, with their gay, rank, poisonous-looking blossoms of orange and purple. Here I have a window that commands Mts. Madison, Adams, Jefferson, & Washington, a superb range – while through a dip in the sky line of one, peers up the dome of Mt. Monroe; nearer is Cherry Mountain with its wooded slopes – and beyond, to the right, stands the grand mass of Lafayette with its jagged, picturesque outlines and the symmetrical pointed dome [of] the Haystack – while afar off the distant Green Mts. of Vermont circle round the horizon. It is a splendid view, extending over wide spaces; and the air here is so deliciously pure, soft, & invigorating that it is a delight to breathe. Frank [Gray] already feels better & looks so – he had a miserable time with his eyes yesterday, coming up. The house is full, and Mary [Gray] & I have to room together till Tuesday, when some go off and we are promised a room for Mary. Frank would give up his room to her – but there is not a place within a half mile where he can be accommodated, so we make the best of our narrow, incommodious quarters pro-tem. Mrs. Hemenway is here and is as always very friendly…, but I keep very quiet and in my own room – I have no spirits for meeting strangers. This afternoon at 4 o’c, we go to drive. I cannot walk here except on the level piazza – but Frank & Mary can take pleasant rambles. We had letters on Tuesday from Rege & Morris [Gray], [and the diarist’s sisters] S.M.L. and S.B.D. Sunday, 29 August 1880: Thursday afternoon Frank took us a delightful drive beyond the Mt. Adams House off Gorham way. It had grown very hot, after the sudden cold of the early morning – and we found the drive home through the woods by the valley road very pleasant. I had a sick restless night – and have been very poorly since – and found several others in the house were similarly affected – cold, no doubt, from the great change of weather, and congestion &c. I am much better to-day – but weak and shall not get down stairs. We had a heavy thunder storm last evg. One bolt seemed to break in our very rooms, it was so near – & sharp & quick as a magnified rifle ball! We are told this morning that it actually struck the ground between us and the Jefferson Hill House near by. To-day is the first dull day we have had. The great Mountains are blotted out entirely by heavy masses of cloud. 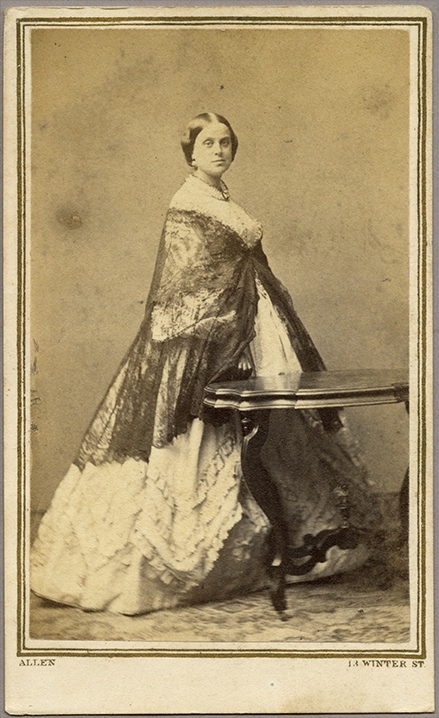 Mary Porter Tileston of New York (1820–1894) was married to Edward Augustus Holyoke Hemenway of Boston 1840–76. The diarist’s younger sons, Reginald Gray (1853–1904) and Morris Gray (1856–1931), both of whom were traveling. Sarah Morris Shober (1825–1917), who married the Rev. William Phillips Lewis in 1868. Susanna Budd Shober (1823–1898? ), who married Dr. John Davies in 1867. Really enjoying these diary passages.